I’m out on a launch in the Havel, the ribbon of lakes that bounds Berlin to the west, with Erika and Juergen. Juergen’s a retired fireman, he’s been messing about in boats for years. All around us, pleasure craft bob in a bowl of blue and green. Amid the trees on the far bank the neo-Romanesque basilica of St Saviour’s Church rises from the water like a baroque barge. “The wall ran past that church,” Juergen says. “It’s not how you imagine it,” I say. Tourist: Is that it? Doesn’t look so bad, does it? This won’t do. 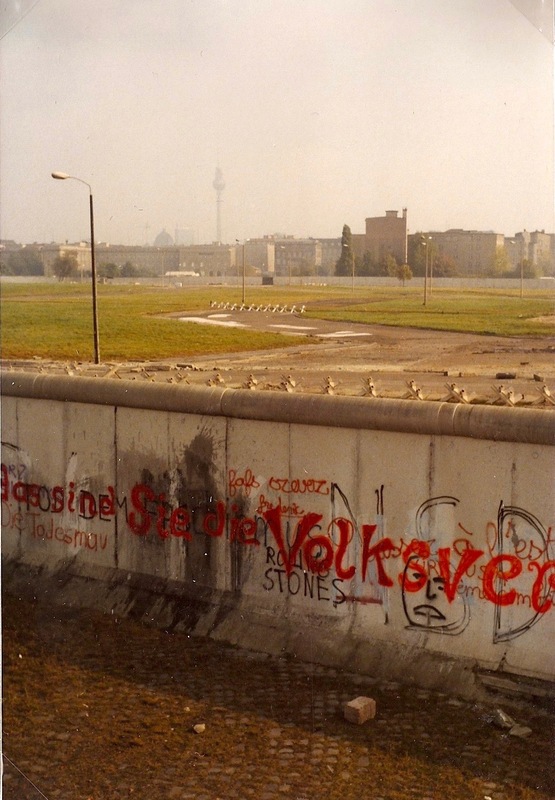 As anyone will tell you who is old enough to have seen what the East German regime called the “anti-fascist protection wall” in all its oppressive horror, “is that it?” was not a common reaction in those days. So how do you get a feel for what it was like? The answer is to seek the bits that aren’t there any more. I walked all 166km of what was the Berlin Wall with a group of friends in 10 weekend strolls. What we called the “wall crawl” started and finished at the Brandenburg Gate, in the bustling heart of the city. The pleasure that accompanied our every step was to perceive how the landscape around us had been sculpted by an impenetrable barrier – that overnight had vanished. In a March snow-storm, we walked down an abandoned motorway severed by the wall and overgrown by forests. In high summer, near the former British air base at Gatow, we walked a swathe of yellow grassland cleared by the wall between stands of dark pine. And where the wall dividing the city once met the Brandenburg countryside, we saw the urban sprawl of West Berlin stop dead at a row of tall East German searchlights, curving over to illuminate nothing. Not everyone has time to walk the wall. So here are my three favourite spots where you can best appreciate the wall that isn’t there. First, is the angular steel outline of Glienicker Bridge, site of Cold war spy-swaps, which has an almost iconic familiarity. Faded 19th-century monuments on each side of the former frontier add to the sensation that time has stood still. From a pier nearby, a ferry (serving excellent beer) runs to St Saviour’s Church. At the church, a display shows historic photographs. Because the nave was on the water’s edge, the wall was built through the tower of the basilica. So for 30 years the church was sealed off: on East German territory, but on the west side of the wall. Alt-Luebars and the Koppchensee is the next spot. If you stand on the village green of Alt Luebars and listen to the church bell ring the half-hour, it’s hard to believe you’re in Berlin at all. Since the tiny settlement was founded in 1247, nothing much seems to have happened. The illusion persists as you cross the cobbled street and descend past riding paddocks into picture-book countryside. Butterflies flutter over water meadows; a herd of goats picks through grass clippings; a heron rises from a stream. But wait. Isn’t that a wall, of silver birches, rising out of the farmland ahead? The 10-year-old trees, a uniform five or six metres high, are a tell-tale sign; they seem to have an affinity with the sandy soil of the redundant death-strip. Sure enough, between the trees lies the concrete track down which East German border guards used to patrol. The Koppchensee, a small lake, lies in what was once the prohibited area on the East Berlin side of the wall. Barely visited for decades, it’s now a nature reserve: hundreds of dragonflies skim the surface. A scene of breathtaking beauty. And just below the water, caught in the gleam of the summer sun? Submerged sections of abandoned wall, dumped in a hurry by a collapsing regime. Paris has Les Invalides. London has Chelsea Hospital. In Berlin, the mix of emotion generated by remembrance of military prowess is different: less pride, more sorrow. If Alt-Luebars feels like a place where nothing’s happened, the former military hospital on the Scharnhorststrasse feels like a place where too much has happened. Now the Economics Ministry, it’s also done time as a Red Army hospital and the East German Supreme Court. The military cemetery, or Invalidenfriedhof, was founded in 1748; the wall ran smack through it. This is my third place. The first East German to be shot trying to cross the wall, Guenter Litfen, died here on August 24 1961. Now, all that remains is a secluded canal-side park, where a sparse population of gravestones rises from scrubby grass. Away from these haunting places, traces of the wall are fading. “More land is being given back and built on,” says Petra Reetz of the Berlin city government. “At the same time, we have to recognise the wall is a high-point for visitors.” The good news is that the authorities plan to construct a cycle path around the old border, making access easier. Monica Geyler from the Berlin Historical Forum is preparing information panels. “The cycle path is coming,” she says. By Robert Pimm in Existential - and women, Journalism on 13/01/2014 .